Remodeling a bathroom has a huge effect on the overall curb appeal and atmosphere of a home. It can make a rustic house seem freshly renovated, and it can add a touch of class to an otherwise understated design aesthetic with its opportunities for small, elegant, and easily noticed stylistic effects. Unfortunately, bathroom remodeling can also be one of the most expensive updates. If you’re looking to make some big changes without going all-in on an investment that overhauls the entire room, here are some smaller projects that have a larger impact than you would expect. Replacing a bathtub can be super expensive, and most of the time it’s just an aesthetic change. If you want to have a better shower experience and you have space, consider adding a separate shower stall instead of tearing out the bathtub and trying to find a combination you prefer. New shower installation tends to be cheaper than taking an old tub out and putting in a combination tub and shower, and in a master bath, it can expedite getting everyone out the door without scheduling conflicts on busy mornings. 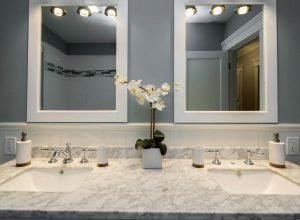 Overhauling your counters and cabinets is expensive and time-consuming, but bathroom remodeling can make them look fresh and new again by updating your fixtures and other bathroom features. Each of these changes is inexpensive, and if you do them all, it will look like a whole new room. Painting, tiling, or rolling out new laminate floors can be a little bit of a project, but all three options are still quite inexpensive compared to a full bathroom overhaul. If your tub and fixtures look good but you still feel like the room is a little drab, a color change and a new flooring choice can revitalize the space. The right choices can even make a smaller bathroom feel spacious again, with just a little bathroom remodeling.